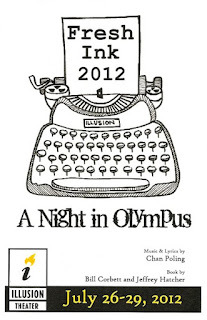 It was a last minute decision to see A Night in Olympus, the final show of Illusion Theater's Fresh Ink series ("showcasing the developing work of new and established artists in Minnesota"). The deciding factor? The cast. Norah Long, Tyler Michaels, Jessica Fredrickson, Randy Schmeling, and Aleks Knezevich - I couldn't possibly miss that! And I was not disappointed. A Night in Olympus is a new original musical (my three favorite words) with an unoriginal story (unpopular and insecure high school girl dreams of being beautiful and winning the favor of the popular boy, only to realize that the guy she really wants is her best friend who's been there all along - see any Molly Ringwald movie from the '80s) told in an original way (gods and goddesses disguised as high school teachers work their magic to make the change come about). The music is great, the jokes are clever, and the cast is indeed fantastic. With a lesser cast the piece might not have worked as well, but each member of the cast reveled in their role(s) and really sold it. An impressive feat considering the limited time they had to prepare and the fact that the script was constantly changing throughout the four-show run. In fact they had scripts in their hands for most of the show, which was no distraction at all, and the show ran smoothly (at least from the audience perspective). The creators Chan Poling (music and lyrics) and Jeffrey Hatcher and Bill Corbett (book) will continue to work on the piece and hope to find another home for it. I'd love to see a full production of the show with the original cast intact! The setting of our story is a high school in Olympus, Indiana, a nowhere town that the kids can't wait to escape from. The lovely-voiced Jessica Fredrickson plays Maggie, the Cinderella-like main character (after playing Cinderella herself at the Ordway last year) who gets her wish of becoming beautiful and popular, only to learn that it's not exactly what she hoped. Her best friend Harry (the incredibly talented Tyler Michaels) can never get up the nerve to tell Maggie that his feelings for her go beyond friendship. When she's transformed into the beautiful girl and no one recognizes her as Maggie, everyone flocks to her except for Harry, who's not impressed by her physical beauty but keeps looking for the real Maggie. He leaves a series of messages on her voice mail, and finally pours his heart out to her in the sweetest zombie-themed awkward love song I've ever heard. Tyler is definitely the one to watch on the local music/theater/dance scene. He's got charisma and stage presence to spare, a great voice, and a really unique physicality about his acting that informs whatever character he's playing and that is captivating to watch (and was on display here in a zombie walk). The remaining six cast members play multiple roles of students, teachers, and gods, with minor costume changes (hoody = student, no hoody = teacher). Norah Long has a lot of fun with her three distinct characters - the shallow popular girl, the stereotypical gym teacher (slash goddess Diana), and our heroine's sympathetic mother - and manages to bring depth and interest to all of them. Mark Rosenwinkel comes alive when his coach character is revealed to be the god Mars ("Thank God I'm a God Again"). Austene Van is truly divine as the beautiful teacher all the boys have a crush on, who is actually Venus, the goddess of love. Matt Rein is the outrageous bully as well as the nice guy teacher who wants to live a normal mortal life. Randy Schmeling is the poor picked on kid who finally gets revenge on his nemesis (ironically named Randy) as well as the nerdy A/V teacher who is actually (spoiler alert) Zeus! Finally, Aleks Knezevich truly hams it up as the stupid jock, the creepy janitor with changing accents, and especially as the evil Hades, god of the underworld. I've only seen Aleks in more serious singing roles so it was fun to see him let loose with something a little lighter. In addition to being great individually, the ensemble works and plays wonderfully together. There are some fun group numbers, including "The Most Beautiful Parking Lot." I know, it sounds strange, but it's so fun and infectious you can't help but smile. I'm a little bummed that I only caught the tail end of Illusion Theater's Fresh Ink series. I'll pay more attention next year; I love seeing and supporting new original works of theater. I imagine in a program like this, the cast is there to showcase the work. But in this case, the cast was the star of the show. And the show was a great vehicle to showcase some incredible talent.